The Twin in Berlin: For It Is Not Just A Great Book, It Is The Word Of God. For It Is Not Just A Great Book, It Is The Word Of God. Another good week here in Leipzig!!! Shout out to Hermana Megan. I love her and she just cracks me up!! Love seeing her pics and showing them to the missionaries here. Man I miss her! This is now the last week of the transfer. I just got here, so no worries on that end, but sister Murdock POSSIBLY could leave. mal sehen!!! We just got back together and it would be a shame to leave one another so soon. But whatever happens, the Lord is in it. For this knowledge I have always been thankful. Weather has been wacko. Some days are really warm, then some days rainy. That's Germany though! I love it. Honestly mom, everything I eat here is amazing. The ice cream though was oh so good this week. We were able to find a less active member, her address listed in the ward list was wrong, but we went to a street that sounded similar to it and what do you know, she was there! She has not been to church in a while and we don't know how much contact she has with the ward. Total wunder! Last week we called a number from our phone, thinking it was a number of a former investigator in the area book, but turns out it was someone entirely different. She was way cool though, and was down to set an appointment out. So we did! We met with her on Wednesday, and talked about what it means to come closer to our Savior Jesus Christ. 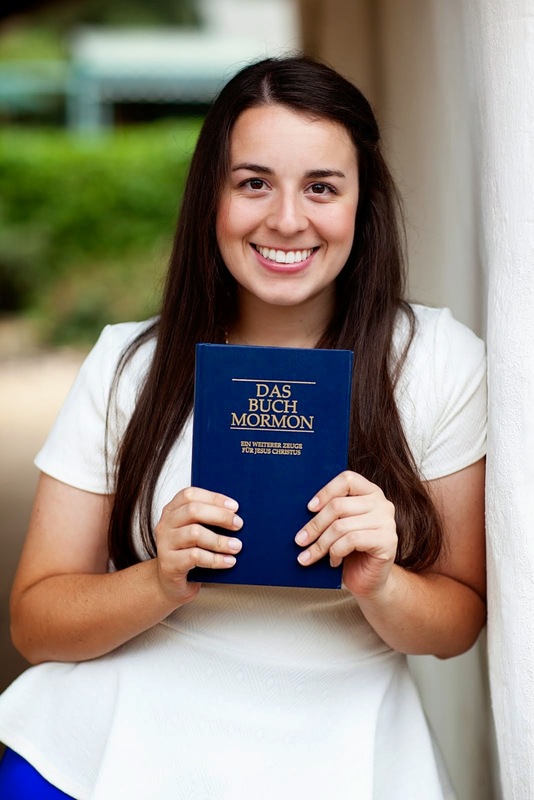 She smokes, and can't read too easily in the Book of Mormon, but she has a desire! She said that ultimately her desire is to get baptized LIKE FOR REAL WHERE DID SHE COME FROM. Turns out she comes to church a lot. Sister Murdock and Elder Clarke thought she was a member. Our commitment for her was to pray just to know if meeting with us was a good idea. The next day she called. She said that she had already thought about it a bit, but felt that it was a good thing to set out a new appointment. So we did! She couldn't make it to church, but we will meet on Wednesday. Total wunder. We were able to meet with Lou a few times! One appointment we brought an American sister from the ward, who actually served here as a missionary. Then on Saturday we met again. We planned to talk about the rest of the plan of salvation, but first we were following up on her reading in the Book of Mormon. The thought came to mind, as we were talking about the book of Mormon being true, to ask her if she really knew what we meant by that. It being "true." So I asked her. She was taught by missionaries a while ago, so we thought she already understood that. Glad that prompting came to mind though, because she didn't know! She thought that Joseph Smith had written it. NOW she understands why it is so important to ask God if the book is true. For it is not just a great book, it is the word of God. ALSO she came to church!!! yaaaaaa!!!! Met the Bishop and even stayed for the second hour. PROGRESS. Still wants to get baptized. She said that had she not come to Germany from china, she would not have realized why faith can be so necessary. That was the best part of the week for sure, hearing her share these feelings. yesssssss tis a good life indeed. Went on austausch with the sisters in Chemnitz. I stayed there with sister Moffet. SHE IS SO SWEET. Just had the best time with her!! Man I love her. She is just so responsible and uses her time wisely. A solid sister. SECOND best part of the week was that we spent Saturday afternoon weeding some cute German lady's garten with Elder Collins and Elder Carpenter! (in the rain!) This is Elder Carpenter's last transfer, so I was stoked to be able to get to see him before he goes home next week. But that was also the hardest part of the week. Saying goodbye. He is like an older brother! I have known him since the beginning of my mission, it will be weird when he is home. He is a STUD though. That was a really fun tausch, needless to stay. Well, I love this place. I love being a missionary. I know that the Book of Mormon was written by prophets called of God, and translated for our day by the prophet Joseph Smith. God loves us, he will show us the way we should take. I love my Savior, Jesus Christ.